AFTER 34 years, Dave Willis and Corinne Walker finally said those two endearing words of commitment and love - I do. The couple tied the knot on Saturday, December 7, at their daughter Amanda's home in Gladstone before heading to their own home for the reception. "Corinne always said we had to be married by the time she turned 50," 54-year-old Mr Willis said. "And she turns 50 this year." So while Ms Walker worked tirelessly on her elegant flower bouquet - a one-of-a-kind dress was ordered from America. "We got the vows from Judy Whicker," Mr Willis said. "I let Corinne select those - I was just too busy at work." The day was celebrated with 50 guests. And friends even enjoyed some light humour from the groom. "At the actual service, walking back through the marquee, my friend said show us the ring and then asked, 'Where are you off to now?'" Mr Willis said with a laugh. "I said, 'Straight to the pawn shop'." Mr Wright has worked for Gladstone Ports Corporation (GPC) for 19 years - but was a head ranger at Awoonga Dam for 15 years before that. 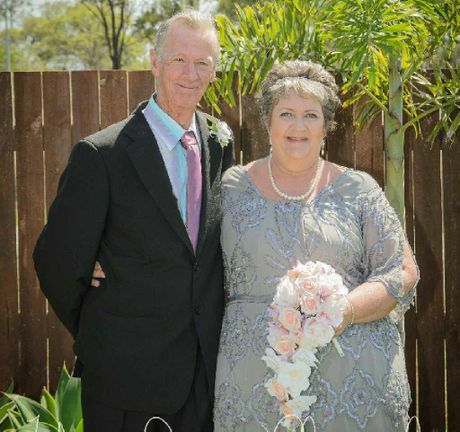 The couple has lived almost 32 years in the region but their love story began in Mount Isa. "We met at a party," Mr Willis said. "I was 20 then and Corinne was 16. "We stayed together and eventually lived together and had a daughter in Mount Isa. And as they say, the rest is history. It was such a beautiful day. "And we can't get away now," he laughed. "I told her she just wanted to get married to get my super."